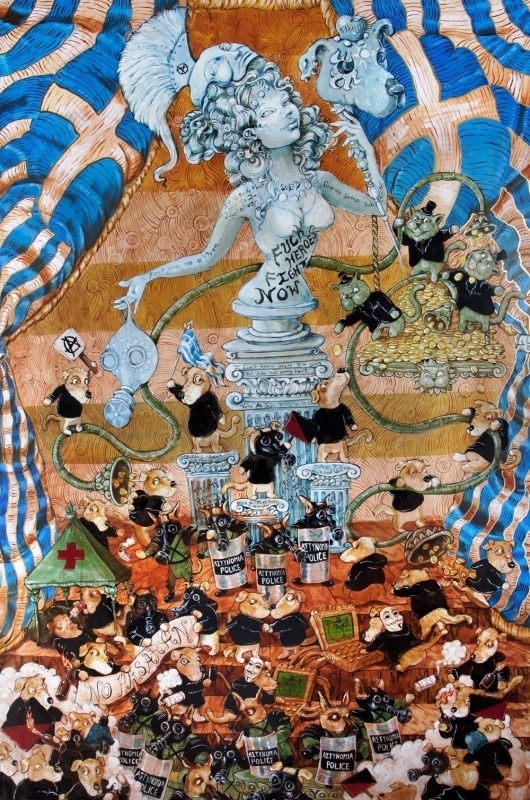 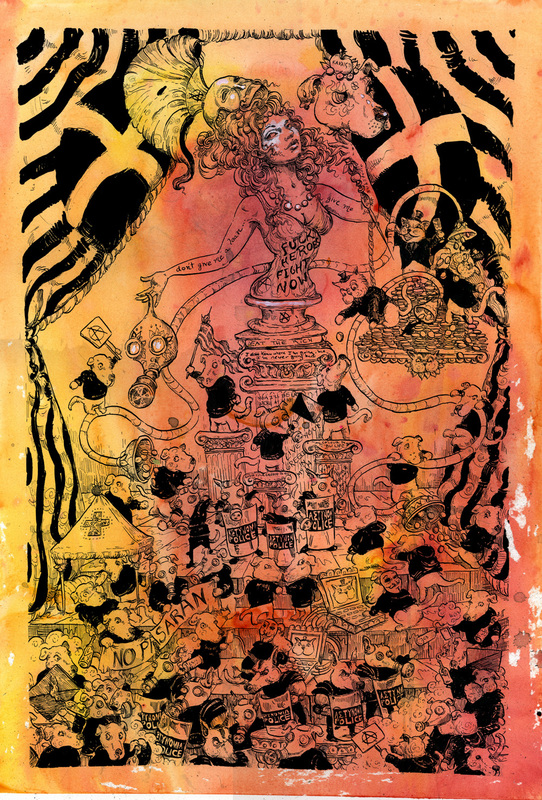 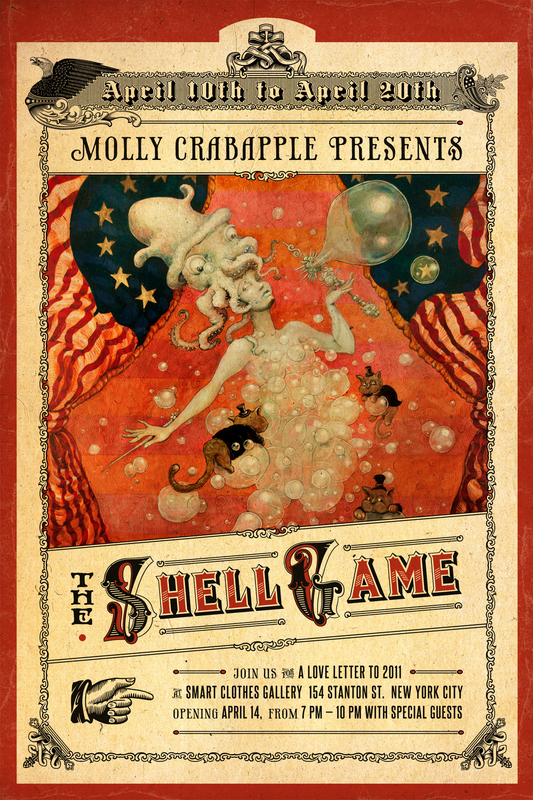 NEW YORK, NY – Molly Crabapple is pleased to announce “Shell Game,” an exhibition of new work. 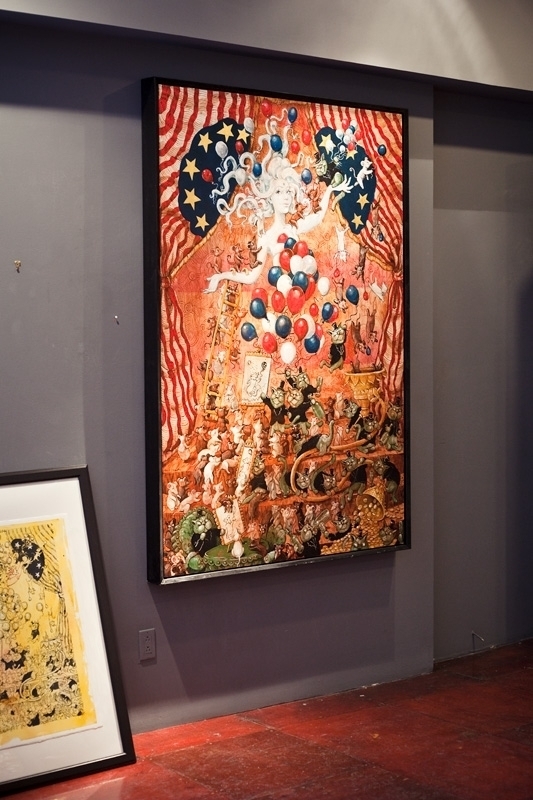 The exhibition will be on view from April 14 – April 23, 2013, at Smart Clothes Gallery, located at 154 Stanton Street, between Houston and Suffolk, New York, 10002. 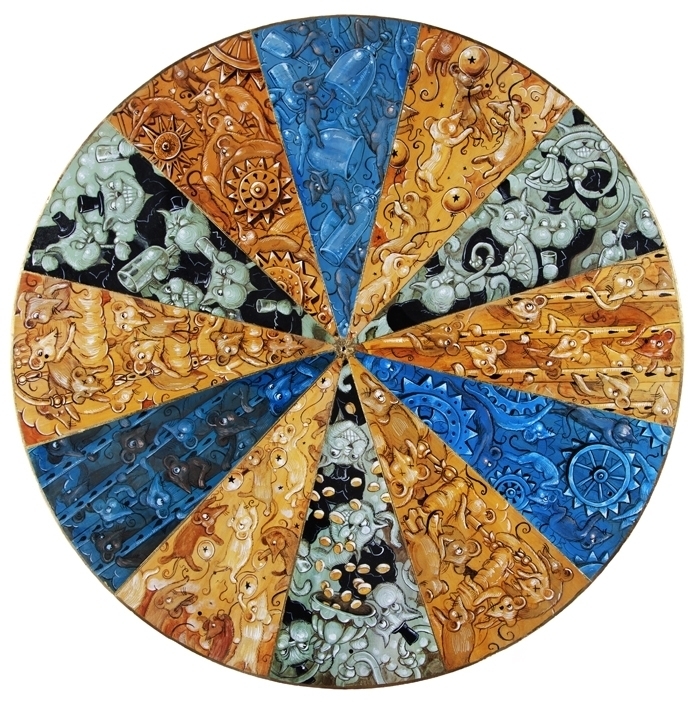 Shell Game is comprised of nine, 6’x4′ paintings and one 3’x3’ painting about the revolutions and crises of 2011 (six of which have already been sold to collectors) including the mortgage bubble, the Greek anti-austerity protests, and Occupy Wall Street, filtered them through the artist’s distinctive lens of surrealism, satire, and symbolic animals and, for eight of nine paintings, informed by travel to the settings, including Spain, Greece, and the United Kingdom, during which she interviewed activists for her reported illustrated journalism pieces and participated in demonstrations. 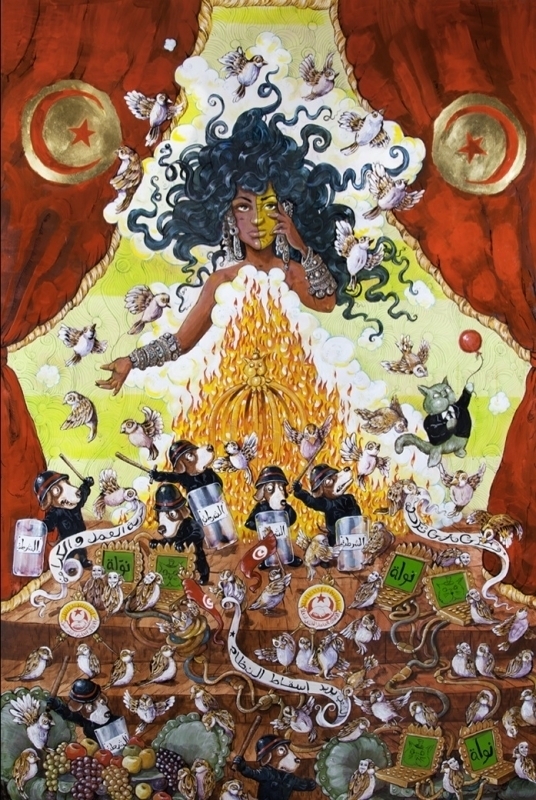 For Tunisia, she interviewed members of Nawaat, the dissident blogger collective, via Skype. 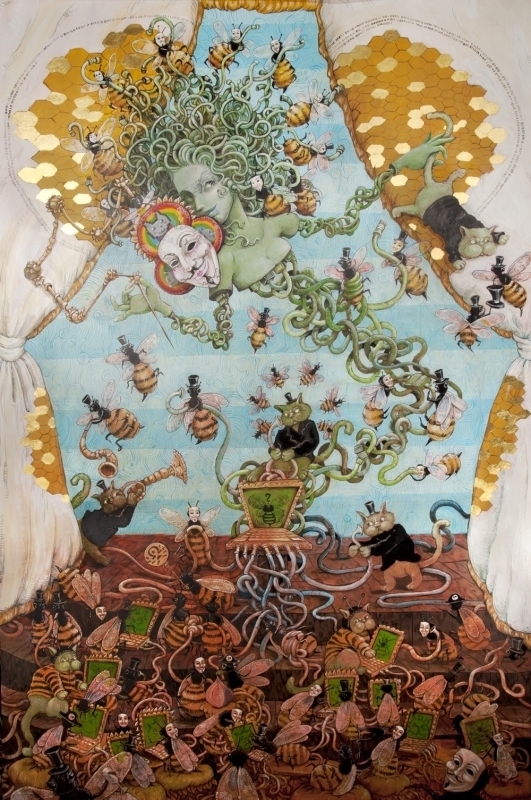 Nine preliminary watercolors, all sold, will also be exhibited. 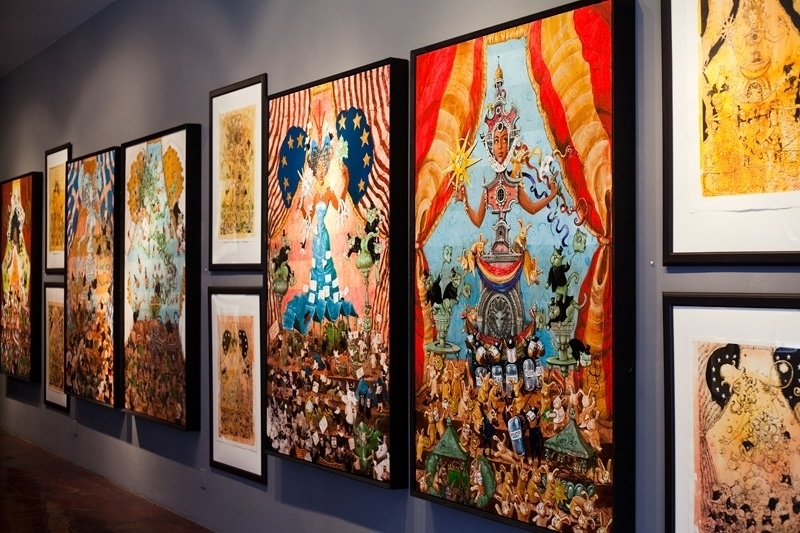 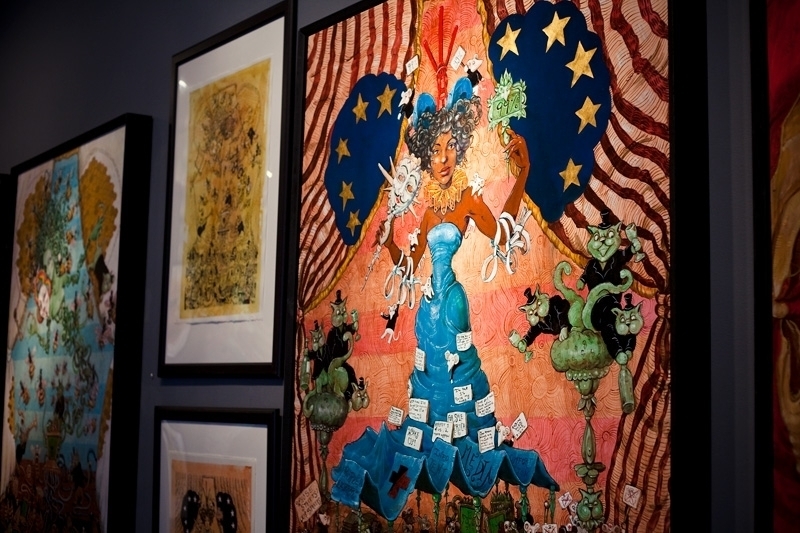 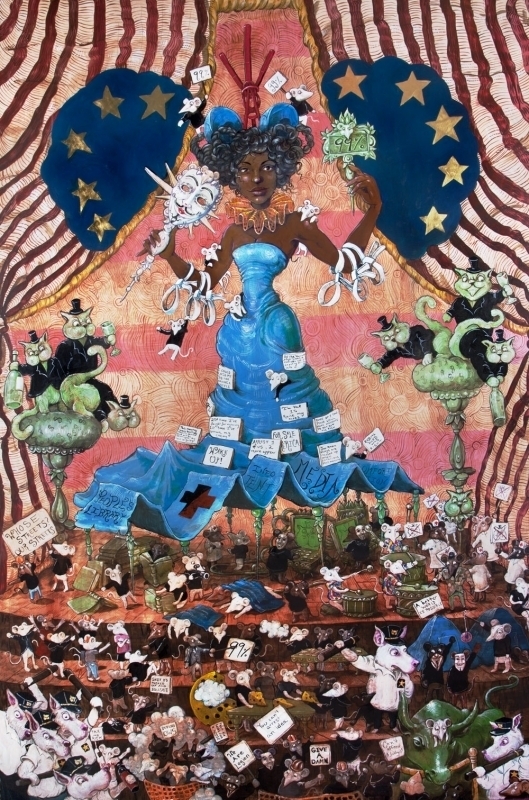 Molly Crabapple will host a public opening reception on Sunday, April 14, from 7-10pm. 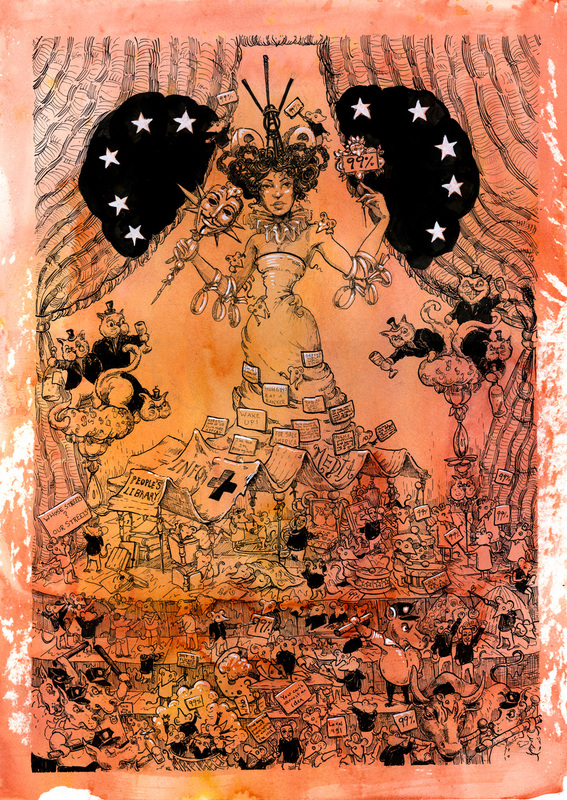 Molly Crabapple is an artist living in New York. 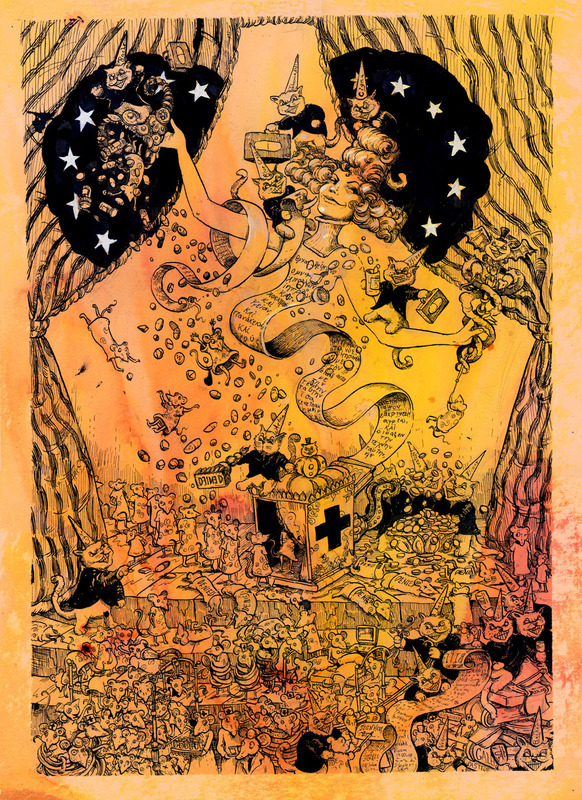 She learned to draw in a Parisian bookstore, and once sketched her way into a Turkish jail. 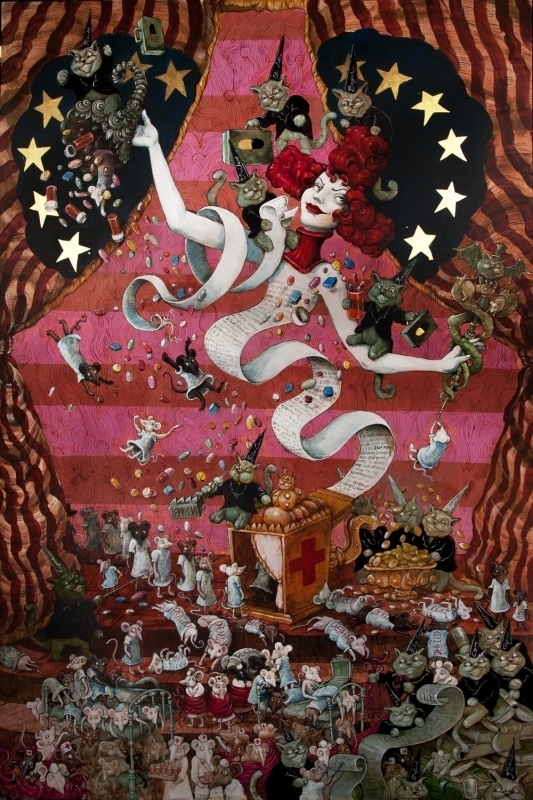 Her recent projects include “Week in Hell,” in which she locked herself in a hotel room, covered the walls in paper, and filled 270 square feet of wall with art; “I Have Your Heart,” a stop-motion short film created with musician Kim Boekbinder and animator Jim Batt. 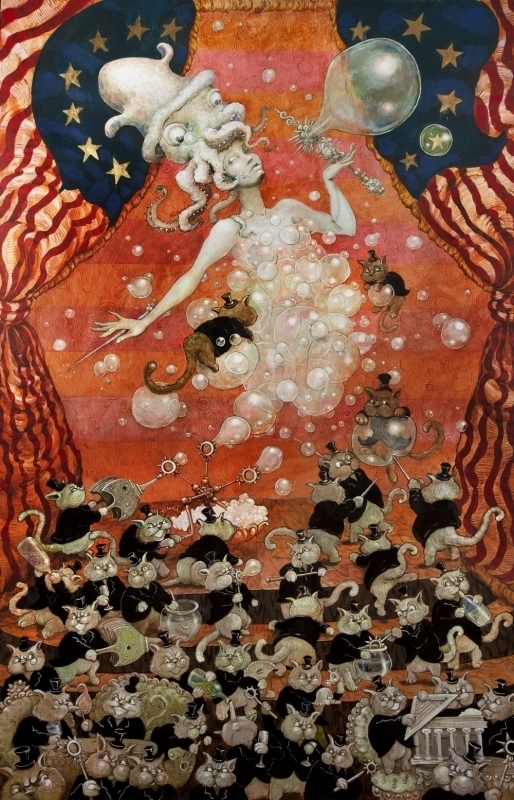 Her works are held in the permanent collections of the New York Historical Society, the Rubin Museum of Art, and the Groucho Club. 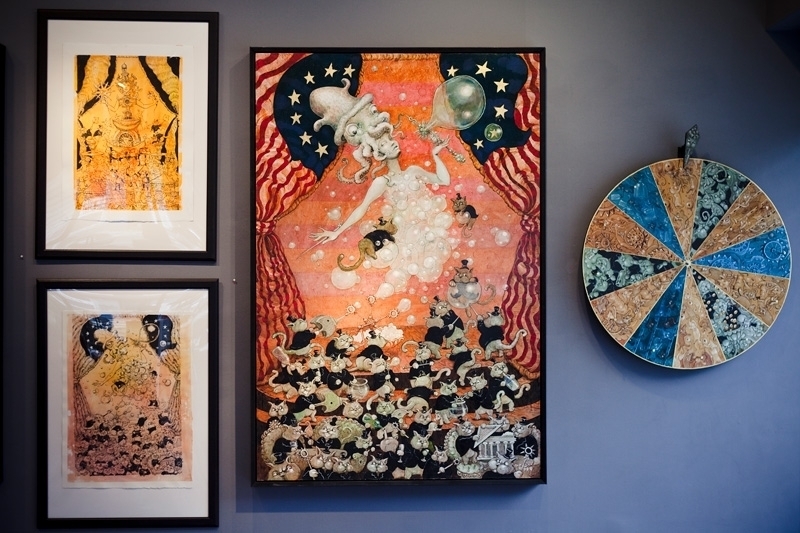 Her celebrity fans and collectors include Neil Gaiman, Moby, Chris Hayes, Margaret Cho, and Tom Watson, MP. 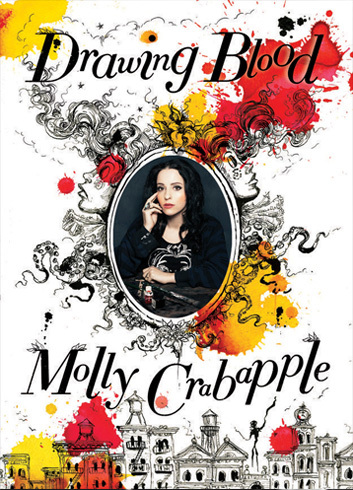 Crabapple has written personal essays about her Occupy Wall Street arrest for CNN, and has a monthly column for VICE. 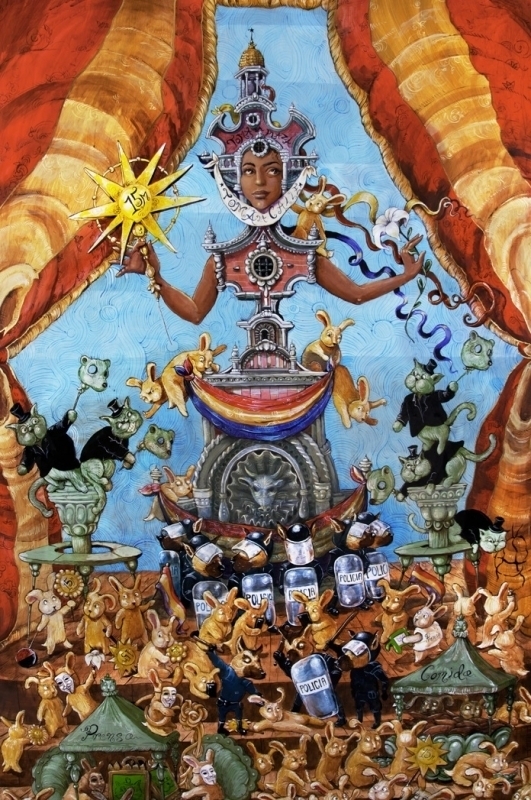 Her published books include Discordia (with Laurie Penny; Random House, 2012), Devil in the Details (IDW, 2012), Week in Hell (IDW, 2012), Puppet Makers (DC Comics, 2011), and the forthcoming Straw House (First Second Books, 2014). 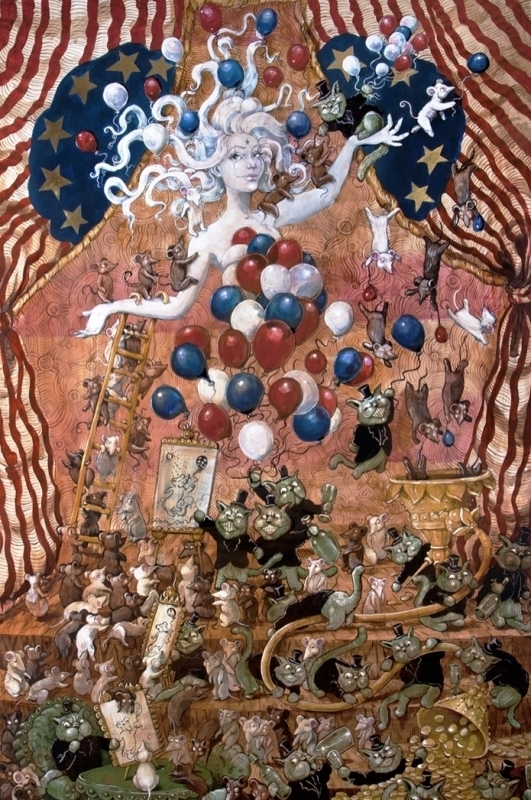 Called “a downtown phenomenon” by the New York Times; “equal parts Hieronymus Bosch, William S. Burroughs and Cirque du Soleil,” by The Guardian; and “a brilliant and principled artist” by BoingBoing, Crabapple has also hosted documentaries for France’s ARTE television channel. 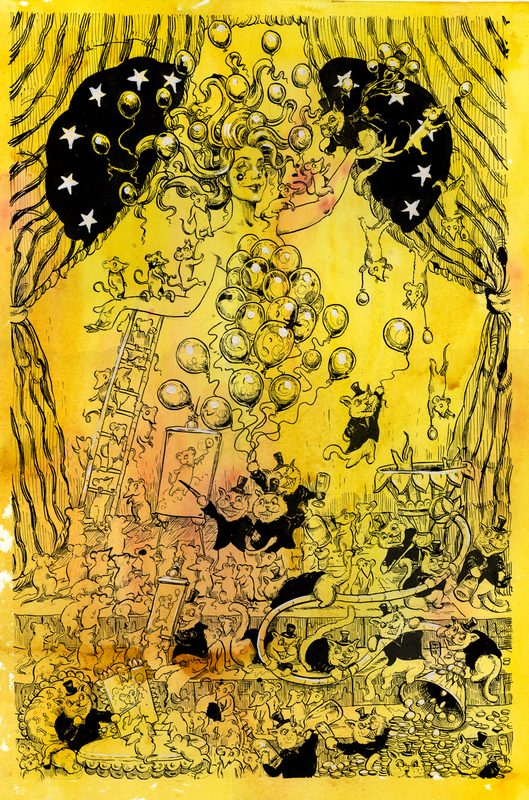 At age 22, she founded Dr. Sketchy’s Anti-Art School, a chain of alternative drawing classes that now has branches in 100+ cities, and has produced events at venues including the Centre Pompidou, the Brooklyn Museum, and Hampton Court Palace in England. 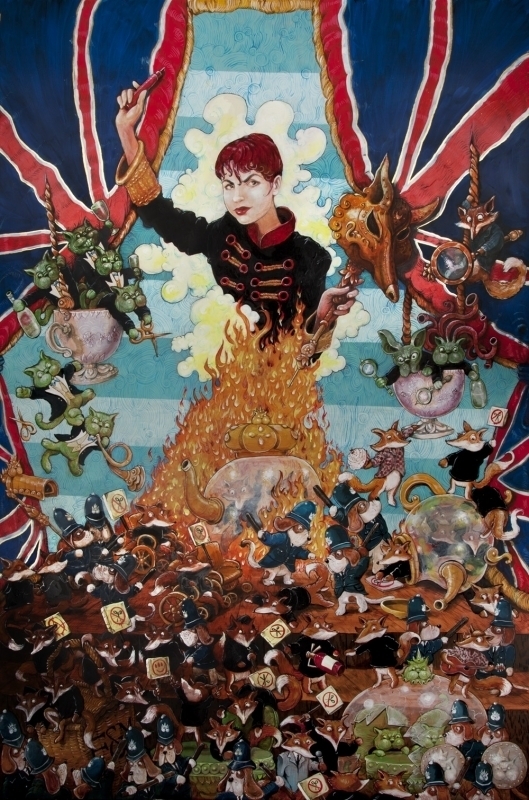 She regularly speaks to audiences around the world, at institutions including the Museum of Modern Art, the London School of Economics, and Columbia University. 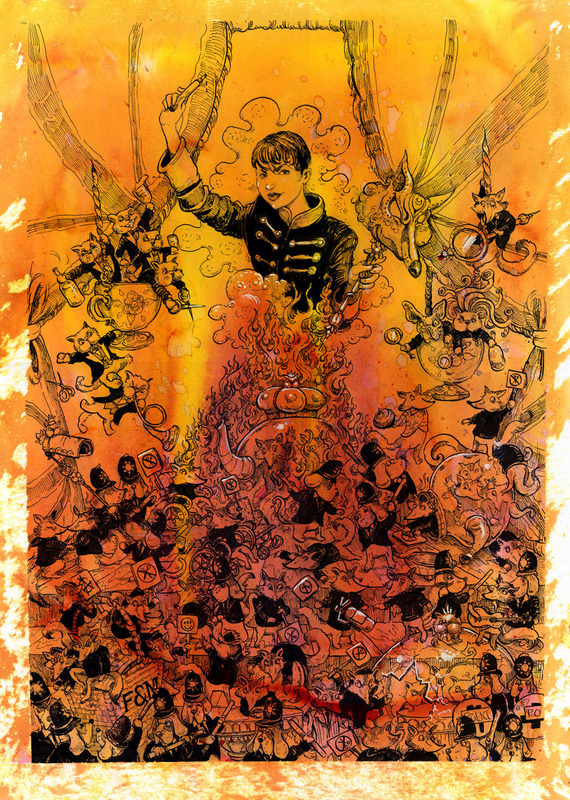 and all 701 of our backers. 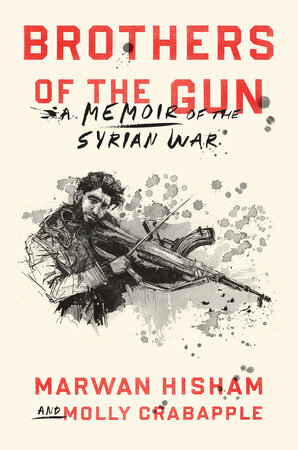 You made this possible! 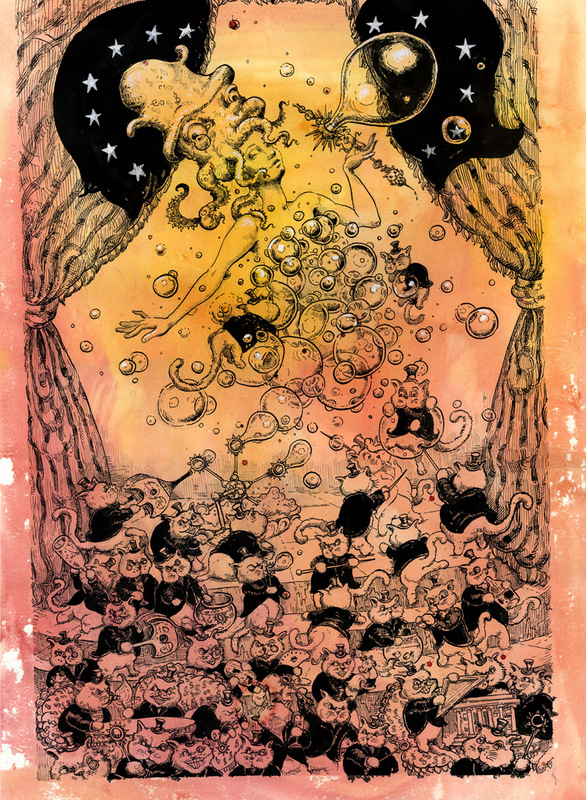 Bart Blake Bonimond Tom B.
Christopher Courtland Janice C. E. C.
Doug drivenbyboredom Dura Randall D.